I read the article below on Yahoo politics, and I completely agree with everything he says. For those that don't know the story, Islam4UK is a political/religious group that planned to march in Luton during a procession bringing the dead bodies of Iraqi/Afghanistan soldiers. It was meant to raise awareness about the fact that for every one British soldier that dies, a thousand Iraqi men, women and children loose thier lives in this pointless war. Now while I disagree with the manner they wanted to go about it, I feel this message desperately needs to be passed across to regular Brits. Its a farce that they are choosing to kill thier own young soldiers but seem to be oblivious to the helpless Iraqi civilians that are being slaughtered on a daily. The group have now be banned for "the glorification of terrorism", making it a criminal offence punishable by 10 years to be a member. Its a sad day for civil liberties. Protestors prosecuted for their slogans, a minority group banned and a trial without jury: whatever happened to British justice? I've always wondered when people say they've had enough of the UK where they would go and why they think things in any other country would be better. Mostly because I have generally held the belief that the grass really isn't greener elsewhere and that actually we've generally got it quite good here. But as the years have gone by I've been sorely tempted to utter the immortal words: "Right that's it. I'm emigrating. This country is going to hell in a hand basket! "I haven't quite done so. Yet. But I came close yesterday. I think, when I am older, I will honestly remember it as the day Britain really did go to the dogs. It marked the day when we all lost a little more freedom. Not only has a fairly minor political/religious group - which would have probably disappeared into obscurity had the media let it - been banned by the government but we also had the start of the first trial without a jury in 350 years. Neither action makes me feel like I live in a safer country. Neither makes me feel I live in a free country. Both things make me feel paranoid, fearful for the future and concerned that we are slipping into totalitarianism. The home secretary's actions yesterday morning were nothing more than populist nonsense designed to garner a few positive headlines. It's always best when doing this to pick on the weakest and most vulnerable in society so in some respects Islam4UK must have been expecting it. I used to think knee jerk reactions like this were just the government responding to the hysteria that had built up around a particular issue but I've long since given up on that belief. I now realise most of it is about positive spin and let's face it, the government and Labour have been a little short of that over the last week or so. Islam4UK said they had made their point but they also made themselves easy prey. The planned demonstration in Wootton Bassett caused outrage for lots of reasons and such a deliberately provocative protest could only have ended badly. One can almost imagine the scene as the English Defence League turn up to "protect" the townsfolk while no doubt ensuring a riot. After all, they're nice and reliable like that. But having cancelled the protest and decided they had made their point why make Islam4UK illegal and membership punishable by ten years in prison? As usual the home secretary trots out some line about how the group concerned is involved in terrorist activity. As usual he can't tell us what that activity is or which terrorists the group is linked to. As usual we are expected to simply accept that he is doing this in our interests. As usual the general population continues on it's merry little way unaware of the stranglehold the government is taking on the reigns of power as more freedoms are eroded until we live only to work, keep our heads down and try not to upset those around us or say the wrong thing in case they grass us up to the secret police. Told you I was feeling paranoid. If Islam4UK can be banned, why not the English Defence League? The English Defence League has organised demonstrations outside mosques and in towns with large immigrant communities in deliberately provocative displays of racial and religious hatred. Why not ban an organisation whose demonstrations' sole purpose is to intimidate whole sections of a local community? Those demonstrations are intended to prove the dominance of one section of society over another through menaces and the threat of violence. Why hasn't Alan Johnson banned them as well? Surely he has overwhelming proof? Meanwhile, I know I fall into the category of lunatic for bringing up Voltaire but I really do fall into the camp where I may not agree with everything a person says but I will defend to the death their right to say it. I really would die for free speech. It's one of my few - and I mean few - absolute principles. Pretty much everything else is up for negotiation. If you think you can change my mind on a subject you're welcome to give it a try. But free speech isn't up for negotiation. And Islam4UK have every right to protest about the deaths in Afghanistan and Iraq. They have every right to raise awareness of the thousands upon thousands of people who have died simply because of Western involvement in their country. Thousands. Thousands of innocent men, women and children. In the case of Iraq almost one million people since the west invaded. Compared to a few hundred Britons. Surely we should be aware of the deaths in Afghanistan or are we saying an Afghan's or an Iraqi's life is worth less than someone from the UK? Protestors have the right to call soldiers murderers, rapists and baby killers if they want to. Just as the men who were convicted in Luton of public order offences yesterday did. That doesn't make what they did right. It doesn't mean it wasn't offensive to some. But their convictions earlier in the week are not only morally repugnant, they are more than likely legally unsound. As one of the men said in his defence, they had made the police aware they intended to make a protest; they told the police what that protest would involve and the police did not advise them not to make such a protest. It was only when the crowd became agitated that they arrested the men involved in the protest. I don't agree with the men that protested, in fact I find most of their views repugnant, but the idea that they can be convicted of a criminal offence for "insulting" the people of Luton is of more than mild concern. I hope I never find myself in Luton. Other than the fact that it's a dump I might offend someone from there(if I haven't already) and find I am convicted of a crime. How ludicrous! How even more ludicrous that we also saw the start yesterday of the first juryless trial in 350 years? And the pretext? It would cost too much money to try to protect the jury from the accused who might try to influence jury members presumably through either bribes or menaces. Far more expedient to have a single judge. Except is it just me or doesn't that make it somewhat easier to bride or menace? After all, there are 12 jurors so that's 12 people you need to try to bribe or scare half to death. Get rid of the jury and there's only one person you have to get at surely? This particular case is uniquely disturbing. The men involved will almost certainly be found guilty because the government knows they are. But there have been a couple of mistrials exactly because of jury tampering so what does the Crown do? It finds a way around the problem. Don't take my trivial tone as just that. This sort of thing angers me to my core but what's worse is the total failure of the media to bother to give more than a passing regard to these events. The population should be in uproar and it should be the press leading the charge. If not, how long will it be before you tell someone in Luton to "f**k off" only to find yourself arrested, charged with breaching the peace by upsetting a Lutonian, tried in front of a Crown Court judge without the benefit of a jury and sentenced to ten years hard labour? Don't think that could happen? Join Islam4UK, sit back and wait. Go on I dare you." i cannot believe they of all people have the right to state what can and cannot be protested against. britain that is always at the fore front of every civil rights issue, opening their big mouth to say how amazing they are because they will NEVER silence the voice of their people. we are not a dictatorship oh! everyone has the right to free speech... hell if you disagree with the queen, your bus fare, garbage pickup route, health warnings or a joke u saw on tv, just write a letter and we will do our very best to keep england jolly. And here they are doing the same thing. where do you draw the line? nobody agrees with parading dead bodies about the place but once you start inventing laws on the spot just to gain ratings and the favour of 'white christain britain' pretty soon just saying your coffee in starbucks is too hot will be considered inciting aggravated retaliation or something. P.S- LOOOVE the matthew west article! Exactly my point, like he said we are fast becoming a Totalitarian state! What a joke! When I first read this news I was angry as I thought they had every right to make a demostration. But this quickly dissolved into sadness. Would it have made a difference if they were protesting in Westminister? I'm not sure. As I have seen similar slogans in protests there but by a more diverse group. 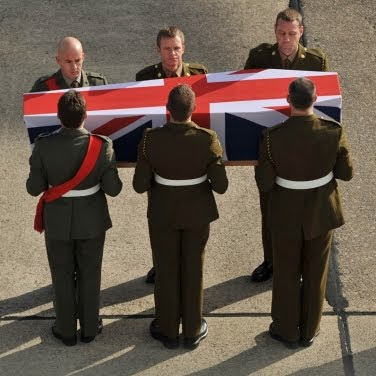 Was it just simply considered an insult too much on the soldiers or is it just simply because they were Islam 4 UK. Or perhaps because the home office can, and they did. I wonder what or who will be next...I probably disagree with most of Islam4UK's concept, but it was this same freedom of speech that got to me. It is indeed a blow to democracy! I believe the home office had the right to do what they did and think it is also the right position to take. Britain is not banning Islams in the UK but why name you org that? Are you speaking for all Muslims? A lot of the civilians that die in Iraq and Afghanistan are due to suicide bombs by local terrorists. I do not support the war but I think such a protest is better carried out in those countries so the radicals will stop such guerrilla tactics. I believe in the right to free speech as well..
And I love the good points u made on the post, and I agree with Voltaire as well.. I not however disagree with ur statement about this being the first juryless trial in 350 years.. Surely, u know that that's not true.. Moreover, on the topic of freedom.. Britain and the U.S are the only two countries that make serious effort to protect those two principles.. So leaving Britian for another country would be serious folly. @myne, the name is irrelevant, there are societies called facistsuk, or communists uk, and they are allowed to exist. Heck the BNP's org is based on the priniciples of inequality of races, and they are allowed to air thier views. Why cant these pple be allowed the same priviledge? And the protest is needed here to raise awareness of the effects the war is having on other people, and not just thiers.